We had a fantastic day yesterday and there were records broken in every camp; from personal milestones to long standing figures that have stood since we started fishing the river 21 years ago. Here at Lower Varzuga, the 10 rods landed 91 fish for the day with Greig T the top scorer on 24 for his rod which was his best ever fishing day by some margin. John G-H landed a 36 inch fish which the Sturdy scale puts at 20lbs and Nick T had two fish in a row of around the 16-18lbs mark. There is a considerable wager going on amongst the rods as to the biggest fish for the week and everyone has taken tape measures this morning to validate their claim for the prize. At Kitza they had 33 for their day with Chris J landing 10 fish. They are going to take a picnic down to the White Sea this evening which is always a highlight of the week as it is a beautiful spot and feels as if you have reached the end of the world. They will hopefully have a sighting of Beluga whales as well as the Arctic Terns that are beginning to arrive from their epic migration. 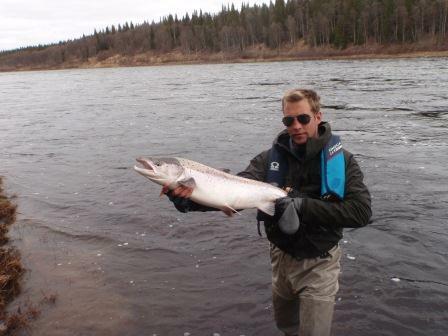 I went up to Middle Varzuga last night which is about an hour from here by boat and the feature of the trip was seeing fish after fish splash and jump as we drove up there. It was a very cold evening and frost formed on the front of the boat as we went up but the sight of so many fish kept any thoughts of being cold at bay. They had another amazing day with 243 fish being put in the book to the 12 rods. 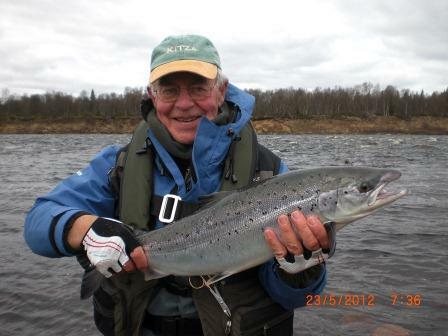 The world record for Atlantic salmon caught in one day was broken yesterday with 67 fish landed to one rod. It is worth pointing out that he went out at 5am and finished fishing at 10pm so it is difficult to say that this is what one can expect when fishing the Varzuga as he does put in a huge amount of time and skill to his fishing. 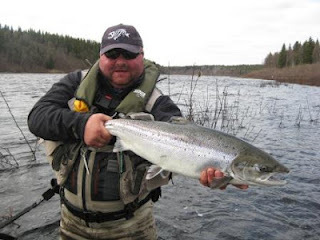 I caught up with him after dinner last night and he thinks this is his 35th week on the Varzuga and his records show that he is 16 fish away from landing his 5,000th salmon from the river. It is an incredible record and does show what the river can produce but most rods prefer to fish the guided hours of between 9am to 6pm and then enjoy the comforts of the camp. 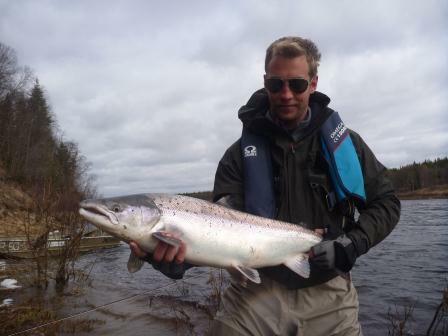 One man who did exactly that yesterday was Mark B and he recorded a personal best of 30 fish to his rod for the day.